Explore the world of detail around you. 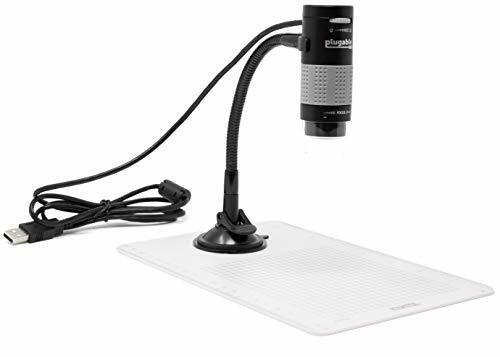 The Plugable USB2-MICRO-250X USB microscope provides up to 250x magnification. The microscope is powered via USB bus power alone (500mA), so no extra power adapter is required. Operates like a standard webcam and can be used with the default webcam software included in your computer's operating system (note that some versions of Windows do not include webcam software by default, although many third-party applications are available for download). Can be used on most computers and tablets supporting USB webcams, including Windows, Mac OS X, Linux, and Android simply by plugging it into a spare USB 2.0 port (OTG cable and app required for Android tablets). Native OSX support using PhotoBooth in 10.5 or above, third party support in older versions. No iOS Support. Useful and fun for students, collectors, testers, and anyone interested in exploring the microscopic world. Uses a webcam chipset and sensor to support nearly any operating system using standard webcam software. Users with an Oculus Rift may require additional setup. LED halo light with brightness adjustment control. Flexible arm stand with observation pad includes graduated marks for easy measurement. Optional software for Windows and OS X adds additional features. Not compatible with iOS devices.